On Friday morning at the NCTE Annual Convention, I sat in a session that featured Tom Romano, Mariana Romano, and Linda Rief. My hands failed me that session. I simply could not get all the ideas down in my notebook fast enough. One after another, each teacher spoke to the importance of giving kids the space, time, and agency to write what matters to them. Write What Matters. Too much of the writing students do in school doesn’t matter to them, at least not in any personally meaningful way. And by that, I mean that the writing doesn’t mean anything to students beyond the immediate, beyond the class they’re taking, beyond the teacher who is evaluating them, beyond the points they’re collecting. It’s because the writing doesn’t matter to them that I’ve seen and heard of students who simply drop their essays into the recycle bin as they walk out of class the moment they’ve gotten their grades. Part of the reason writing doesn’t matter to most students is because they know, as we do, that the assignments we give are contrived, and that there is no assignment more contrived than the 5-paragraph essay. 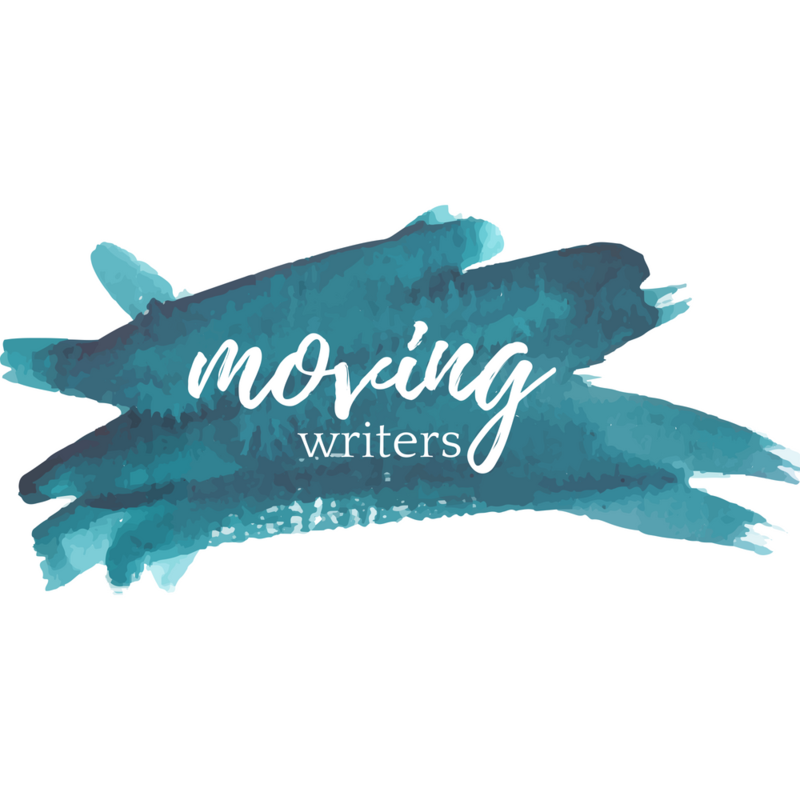 I’ve written about the tyranny of the form on Moving Writers here and here. And while I’ve committed myself to freeing myself (and my students) from under the form’s weight, I continue to struggle with the how. 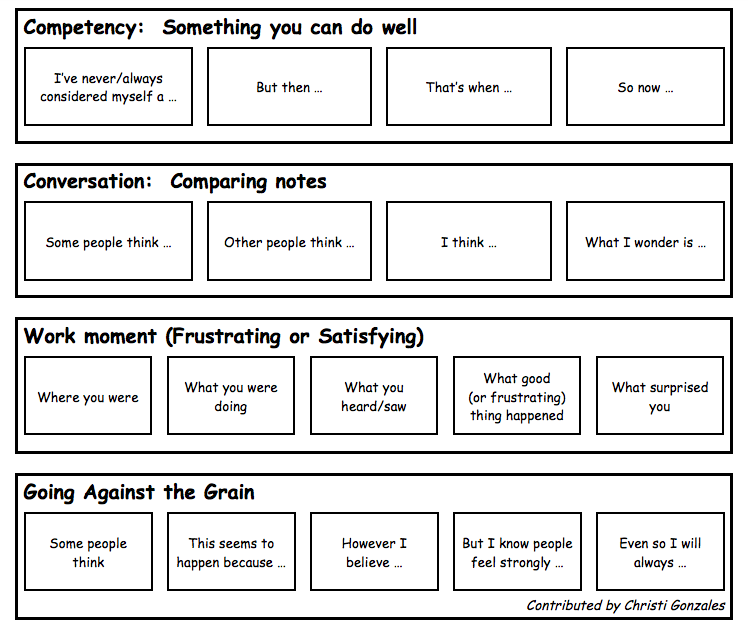 Students—especially my 9th graders—still need a framework for organizing their ideas. So last year I taught them the Aristotelian structure, which is the classical arrangment of argument. My 9th graders came in from middle school with an understanding of the 5-paragraph essay; my job was to move them beyond it. In the Aristotelian model, I explained to students, there are five parts versus five paragraphs. I first came across this model in my own rhetoric courses, then again when I began teaching AP Lang & Comp. It wasn’t until last year when I came across Ray Salazar’s provocative post, “If You Teach the 5-Paragraph Essay, Stop It!” that I realized I could use the classical arrangement for literary analysis and response. So I took Salazar’s advice and stopped teaching the 5-paragraph essay for literary analysis (and in general). Instead, last year, my students wrote three 5-part essays for the following texts: Much Ado About Nothing, Lord of the Flies, and Things Fall Apart. The result? Well, they were about as good as I expected them to be, especially at first—which is to say, they were not very good at all. I could tell that students were confused. I couldn’t blame them, though. After all, it was my first time teaching this new form, and my own inexperience was clearly reflected in their writing. Introduction: What brought me to this piece of writing? What inspired me to write? Narration: What needs to be clarified before I continue? What background or context does my reader need to know? What’s the backstory? How did we get here? Confirmation: What supports my point-of-view? What evidence allowed me to arrive at this argument? Refutation: What are other ways of seeing these ideas? How are they valid? Conclusion: All that said, what are the benefits of seeing these ideas from my point-of-view? By the time my students wrote their third essay in this form, I could, for the first time, actually see their thinking on the page in a literary analysis. The funny thing about the 5-paragraph essay is that it’s actually not set up to be an argument (or, I might argue, for deep thinking). For years, I told students to make sure that their thesis statements were “arguable,” but what did that even mean? More often, students’ thesis statements were expository in nature, and then students spent three paragraphs telling me how they were right this way, this way, and finally, this way. Making a statement and then explaining in three different ways how that statement is true is somewhat dishonest as far as argument is concerned. What true argument does, and does well, is consider multiple views, weighs and wonders, looks at things by stepping back and zooming in. For me, the most powerful part of my students’ essays was the refutation. Unless students could honestly articulate and explain how other points-of-view were valid, their arguments weren’t really arguments. While the classical arrangement worked well last year, I’m so excited to add in real-world text structure models for my students. At another NCTE panel—a tribute to the work of Tom Newkirk—retired teacher and author Gretchen Bernabei shared how she was inspired by Newkirk’s challenge to find “teachable alternatives” to the 5-paragraph essay. Sometimes students are the best teachers. I used to think that teachers had to have all the answers. But over the years, my experiences with students have shown me time and again how much I don’t know, and that admitting how much I don’t know has been humbling and powerful. So now I think that there are times that my students are the best teachers. This is what Gretchen calls a “kernel essay.” It’s small writing, but writing that has so much room to grow and move. I love the ways in which using these text structures can open up students’ writing and thinking. Every NCTE conference, though I come home with many takeaways, there are often one or two key moments that make my jaw drop and think, “Of course. Why didn’t I think about that before?” Learning about these kernel essays was one of those moments. Narrow down to 1-2 most compelling sentences (the ones that are “itches needing scratching”). Browse various text structures, with each text structure on a separate slip of paper. Students can play around with the possibilities, deciding where their sentence might best fit. Fill in the other parts of the text structure. Afterwards, or simultaneously, students then study a real-world mentor text that uses this text structure (Gretchen’s book Text Structures from the Masters includes mentor texts for 50 different text structures). Since my students are also completing an Article of the Week (a la Kelly Gallagher), I hope to have them go back and then identify (or create) new text structures based upon those readings. Gretchen, herself, shared that her students started to find new text structures the more they read and wrote. (And because Gretchen, like so many teachers I know, is so generous, you can find more about kernel essays and text structures on her website here). By collecting real-world models for organization, students can start to see the varied and rich ways that their ideas can be expressed—that their writing no longer needs to be tied down to 5 paragraphs. How do you use text structures in your own classroom? 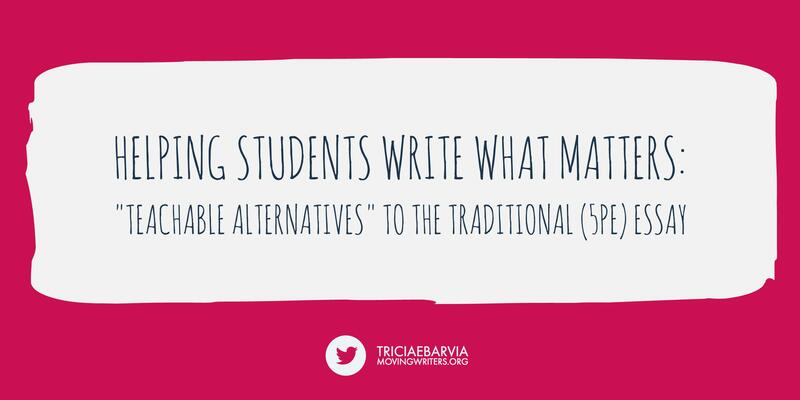 How do you get students to move beyond 1 or 2 templates to see the richness of writing in the real world? We threw out all of our argument writing curricula for this and I am SO excited. THANK YOU for putting so much work into this and sharing it! I’m thrilled. GREAT post, Tricia–thank you! The second half will require a bit of time to ponder and digest, but the first half resonates immediately. Quick favor: clicking on the link to your first resource (the organizer that compares 5-paragraph and 5-part essays) takes a reader to the MS Office 365 sign-in page. Is there a way you could liberate that organizer so that those of us who don’t use this platform might see it? Thanks in advance, hopefully! The title of this blog caught we instantly. I am a pre-service teacher who is currently learning this, to get away from the traditional 5-paragraph essay and find alternatives. I am in an Issues Teaching Writing course where the professor constantly has to remind us that, once in college, this form of writing is obsolete. However, she still has freshman in her W131 classes that only write this way, as this is the way they were taught and were told that they would have to write once they got into college. The thing is, the only time that this traditional method is used is during the standardized testing. Once in college, a five paragraph essay would not be enough to cover everything that a ‘good’ paper should cover. I loved reading this blog because it reminds me that I will have to get my future students away from this method of writing. I liked how you introduced the 5-part essay. I can understand how it will probably confuse students at first, but in the end will benefit students so much more than having to relearn how to write once they enter college. I also enjoyed the different text structures examples. I am always looking for activities that I will be able to use in my classroom, and this is one that I will definitely be borrowing. Thank you! Tricia, this is not only a wonderful reflection on your learning, but a great resource for those of us learning with you. I am doing a one day workshop on Teachers as Writers and I think I just found a writing activity I want to include. Thank you for sharing. Thank you, Leigh Ann! I really loved hearing about Gretchen’s work, and I think it should be shared with all teachers!